Building a palette based on a triad of colors and in the process achieving a combination of intense as well as subdued colors that are inter-related.Presented is a practical for experimentation. During my class, I often have my painting students experiment with what Robert Henri called chords. As I have mentioned in previous blog posts, a chord is a simple triad of colors on which to build a palette for a particular painting. What is unique about a chord is that the combination of colors used resonate off one another causing a feeling of intensity or vibration between the colors. They are not complimentary, so the intensity between the colors is captivating but lies somewhat hidden. Also, as one builds the palette up from the triad, all of the additional colors added to the palette are a combination of that triad. 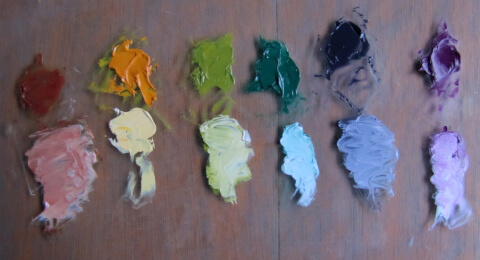 So there is a unity and inherent harmony within the palette prior to commencing with the application of paint. 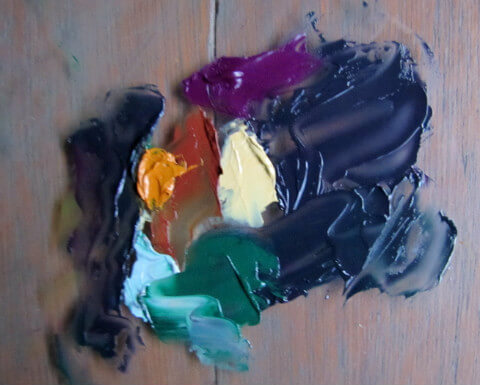 The key to making this type of palette work is to allow some portion of the triad to remain in a pure state without overworking in the mixing process. I am not stating that the color should be left in a strictly pure state exclusively- i.e. like Pointillism or some forms of impressionism, but there should be a feeling of the chord within the painting. What attracts me to this form of painting is that there is an inherent harmony within the chord, comprising of both intense colors and more subdued tones. And it is these less intense colors that act as a foil for the more intense colors creating beautiful complimentary tones through juxtaposition. These more subdued tones, that cover a larger portion of the canvas , create the fabric on which the intense tones can vibrate. When I first came to Robert Henri’s color theory, it was through the writing of Valerie Ann Leeds and Michael Quick for an exhibition of Henri’s portraits at the Orlando Museum of Art in 1994. Michael Quick had investigated Henri’s archive at Yale University for his extensive work on George Bellows. Bellows, a student and dear friend of Henri’s had experimented extensively with all of Henri’s chord studies. But it is one thing to be an art historian and another thing to be at the practical end of painting. Over time there was much of Quick’s theories regarding Henri’s working technique that was flawed which I subsequently found through my own work in Henri’s archive. But I do not under estimate how influential his writing has been in regard to my own direction as an artist. YYG(bi)- is created by combining the OY to the G. It is a bi color because there is a slight neutrality because both O and B are present- the B being part of G.
B(hue)- The combination of G and P makes a beautiful low intensity blue while still appearing to have color. The value is higher than ultramarine and appears blue in its pure state without moving toward a gray or black. O(hue)- The combination of OY and P makes a deep O. One has to be careful with the purple because if there is too much blue in it this color will tend toward the green instead of the orange. As you realize, I have not indicated what brand name of colors one is to use. That becomes a matter of preference for each artist. Also, the more one experiments with this process, the more one can adapt it to one’s own style of painting, choosing colors that speak of one’s own images. Above is an example of a mock composition using this chord. What distinguishes a bi-color from a hue? In the example above of the chord OY-G-P, I see how you get blue and orange hues by combining the 2 colors of green and purple and orange-yellow and purple respectively, but how do you arrive at the term “YYG”; why wouldn’t you call it OY-G? That is an excellent question. Let’s look at the color YYG which is the same as OY+G in this chord. In the Bi colors one combines a secondary color with a tertiary color. In the Hues, one combines two secondary colors. This is how the YYG falls along the spectrum: OY-OYY-Y-YYG-YG-G. The YYG falls between Y and YG, but is slightly neutralized by the fact that red is present in the mix (this is what makes it a Bi color): OY= R+Y,+Y. G= Y+B. So if we look at the basic colors of the mixes we have 3 parts Y, 1 part R, 1 part B= 5 parts.It can also be written as 3/5 Y + 2/5 P. This P will be more toward the blue because the portion of red is smaller ( it is 1/3 of OY rather than the 1/2 blue portion present in the green.) hence, one gets a greener tone with more blue. And with this equation it simplifies one’s understanding. YYG is predominantly yellow with a smaller portion of purple added to neutralize it slightly and move it toward the green. A Hue,as I said, is the combination of two secondary colors. G+P is B hue. G is 1 part Y and 1 part B. P is 1 part R and 1 part B. So now one has 2/4 B mixed with 2/4 O. So if we examine these proportions the Blue is more neutralized as a Hue. The neutralization is 1/2 portion. So this is what scientifically underlies the Bi colors and the Hues. I have not gotten into the fact that the YYG Bi will be slightly different depending on the chord used. But another time. Thank you for your reply and further explanation. If I understand YYG as explained, I can then extrapolate to make the bicolor BBV which falls between B and BV on the color spectrum, is the same as GB + V and is a mix of 3/5 B and 2/5 O (1 part Y + 1 part R). So does OYY= O + OY (3/5 Y + 2/5 R)? And, does a bicolor imply a certain neutrality? That seems to be the case for YYG and BBV, but not for OYY, as I understand it. A Bi color does imply a slight neutrality. YYG is a combination of O+YG. The neutrality coming from the red and green present in the combination. Although YYG falls on the spectrum between Y and YG it is not the mix of these two. Because of its neutrality, it falls below the pure spectrum and resides in the Bi colors. Since learning about the chords in your figure painting class I have been using them and even though they are still new to me they have caused the color in my paintings to be much more vibrant and at the same time harmonious. I also am beginning to see and understand color in painting in a whole new way it is very exciting. Very helpful. I am going to practice this. Thank you from a beginning painter.